Update: The URLs for the tagcloud files have now been updated. See original post for more information. 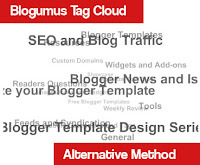 Blogumus is an animated tag cloud widget for Blogger powered blogs, which has proven to be the most popular widget ever published on this site. If you have experienced problems in displaying Blogumus in your Blogger template, this alternative method for installation should enable Blogumus to display correctly for you. This method of installation is very similar to the original one. Firstly, go to Layout>Edit HTML in your Blogger dashboard. Do not check the "Expand widget templates" box as this would complicate the process! Now preview your template. If the installation is successful, you should see the Blogumus widget appear in your sidebar. You can then proceed to save your template. This version of Blogumus should display all of your labels without issue, and can be moved to other sections of your layout through the Layout>Page Elements screen. As with the original widget, it is possible to customize some aspects of Blogumus to better match the style of your blog. Change these dimensions (in pixels) to a more appropriate size for your sidebar or widget section. Note: it is better for the tag cloud to be wider than it is tall (landscape proportions) which enables proper display of the tags. By default, this is set to white, but you can alter this to any value you prefer. This six character tag is actually a hex value without the preceeding # symbol. You can alter this to be any hex color code you prefer. For example, if you prefer smaller links, change this value to "10" (or even smaller). You can always preview the changes before saving to ensure the links appear in the style and size you prefer. I hope this alternative method works for you! After much testing and modifications, I feel assured that these new installation instructions for Blogumus should work for any Blogger "layouts" template, regardless of the length of label names, other scripts present in the widget, and so on. As far as I can tell, no labels should be "missing" from the cloud (an issue reported by many in the previous thread, for which we cannot discover the problem!). If you do experience issues with this alternative method, please do let me know.